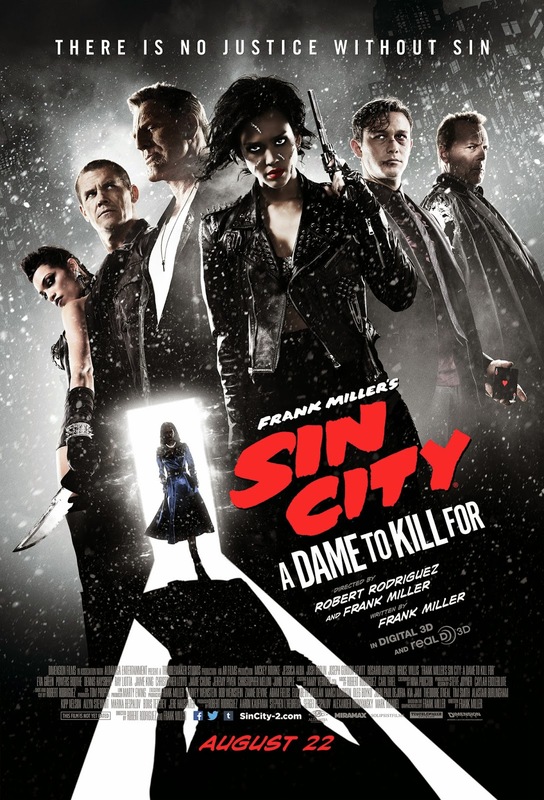 Film Review: "Sin City: A Dame to Kill For" (2014). “Sin City's where you go in with your eyes open, or you don't come out at all.” This describes the second installment of Robert Rodriguez and Frank Miller’s 2005 neo-noir crime thriller film Sin City. Sin City: A Dame to Kill For is once again co-directed by Rodriguez and Miller, based on Miller’s Sin City series. Particularly based on the short stories Just Another Saturday Night, which is collected in Booze, Broads, & Bullets, the sixth book in the comic series. Two original stories (The Long Bad Night and Nancy's Last Dance) were created exclusively for the film written by Miller. The film this time follows some of Sin City's most hard-boiled citizens when they cross paths with a few of its more reviled inhabitants. The film stars an ensemble cast including returning cast members Mickey Rourke, Jessica Alba, Rosario Dawson, Bruce Willis, Jaime King, and Powers Boothe. Newcomers to the series include Josh Brolin, Joseph Gordon-Levitt, Eva Green, Dennis Haysbert, Ray Liotta, Christopher Lloyd, Jamie Chung, Jeremy Piven, Christopher Meloni, Lady Gaga, Alexa Vega, Julia Garner, and Juno Temple. The performances in this film were all brilliantly portrayed. But, like the film itself, it did not capture the 'lighting-in-the-bottle' magic that the original captured. Most of the cast I have to give points for maintaining great performances. However, there were a few cast members who did not deliver as much as I have hoped. Firstly, Chung who played the character of Miho. Who was originally played by Devon Aoki in the first film. Unfortunately she did not deliver the same violent, gut-wrenching punch that Aoki did. Secondly, Haysbert who took over Michael Clarke Duncan's role of Manute after Clarke Duncan tragically died before production began. Sadly to say that Haysbert can never fill that role after the death of Clark Duncan. Never. Thirdly, Piven as Detective Bob. Even though I do admire him as an actor and a comedian, I felt he could not play the role of Detective Bob as well as Madsen did in the first film. In addition, his character was given VERY little to do. Lastly, Eva Green as... well... Ava. Though she brought a seductive, femme-fatale character to the film, unfortunately it felt no different to all the femme-fatales in cinema history and brought nothing unique to the role. While possessed with the same stylish violence and striking visual palette as its far superior predecessor, Sin City: A Dame to Kill For loses the first installment's spark in a less deftly assembled sequel. The film has a lot of blood and disembowelment, to be sure, but it doesn't have the violent punch that the original had and it does not have the desire to be taken seriously. In the end, it’s poorly crafted and audiences should just go and see the first one. This film delivers nothing new and it’ll only make you either sleep during the whole duration or check your watch every five minutes. Also, see my review for Spy Kids: All the Time in the World.